This was purchased for the master bedroom and will now be used in a guest room. Beautiful rug. Still can’t believe these are washable. 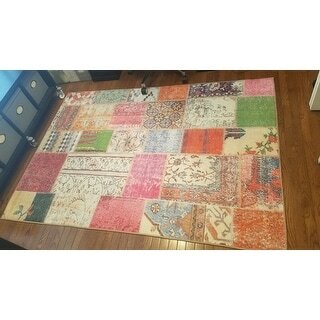 I wish Ruggable made 10 X 14 rugs! RUGGABLE is the 2-Piece decorative rug and flooring solution of the future! Protect your floors from spills, skids, and scratches with one removable Rug Cover and one cushioned non-slip Rug Pad. This innovative technology makes it possible for small and large area rugs to be washed as easily and frequently as bedding, leaving your entire living space looking, smelling, and feeling clean! With RUGGABLE, rug cleaning is easy as 1... 2... 3. Separate, Wash, Reapply! Simply separate the Cover from the Rug Pad. Machine Wash the Cover (Cold), and Dry (Medium Heat) in any conventional washer and dryer. Spot clean the Rug Pad as needed. Easily reapply your RUGGABLE cover to the rug pad. Ruggable uses patented Cling Effect™ technology to keep the cover attached to the rug pad. The underside of the cover grips to the top surface of the rug pad, similar to hook-and-loop fasteners. MACHINE WASHABLE 2-PIECE RUG SYSTEM - Every Ruggable rug purchase includes 1 rug cover and 1 custom rug pad. The decorative and machine washable Rug Cover combines with a cushioned, non-slip Rug Pad to create Ruggable's stylish and durable area rugs. Toss the cover in the washer/dryer and voilà, your Ruggable is ready to use again! Ruggable rugs stay looking clean and fresh, all while protecting your floors. PET AND KID FRIENDLY - Whether Junior spills his juice or Fido's fur has you in a frenzy, Ruggable's machine washable, water repellent, and stain resistant design can handle the daily wear and tear of a bustling household. The non-slip pad provides cushioning, thickness and security, keeping your Ruggable firmly in place under toddler feet and puppy paws. SAVES TIME AND MONEY - No more wasting time and money on professional rug cleaning services; with Ruggable, clean-up is easy, convenient, and affordable. Instead of spending time cleaning or renting specialty equipment, you can enjoy relaxing in the comfort of your home. ECO-FRIENDLY AND SUSTAINABLE - With Ruggable's patented system, wash and reuse your rug cover whenever you need, avoiding the waste and cost of frequently replacing rugs. 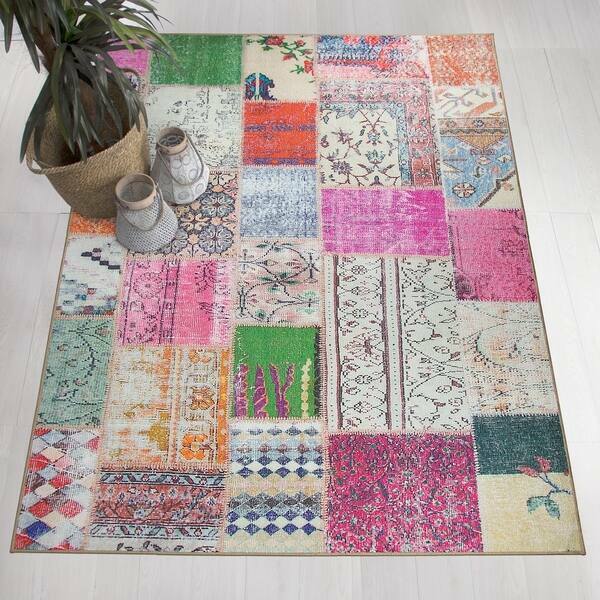 The Rug Cover is 100% eco-friendly and sustainable polyester, and the Rug Pad is made from 100% polyester surface from recycled plastic bottles with TPR (thermoplastic resin) non-slip backing. VERSATILE - Ruggable rugs are available in a variety of colors and patterns to suit any home decor style. Their pleasing and practical design is perfect for any room in your home: the entryway, mud room, living room, dining room, bathroom, rec room, kid's room, nursery, and all types of flooring. I am in love with these RUGGABLE rugs! We purchased this rug for our home office and needed a thin, low pile solution so that our rolling office chairs would roll easily. The bold print was a nice addition to black furnishings with darker gray walls, really giving a pop of color and life to the space. 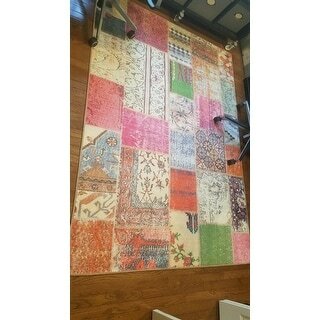 Although rug looks to be different rugs stitched together like a bohemian vintage rug might, it's a printed flat design with no raised stitching in the middle of the rug. The illusion of the stitching being there works perfectly since I didn't want to have bumps to roll over! Rug arrived packaged well, was clean and free of odors. I hope you keep bringing more patterns of this brand of rug to your site as we have a new love of these rugs! Update: Still looks nice. Has been washed several times and currently still looks like new. I don’t understand why this brand of rug hasn’t had more press. I have 4 rescue ShihTzu’s and while they are amazing, accidents happen. You find a spot that can’t be spot cleaned, just peel the top and place in washer. Then spot clean the rubber backing. Feels and looks like a normal rug. It doesn’t matter to me, but my rug is not rich pile. The kind you sink your toes in. I bought one to brighten a dull room and my first Ruggable. Now each new rug I buy will be another Ruggable. 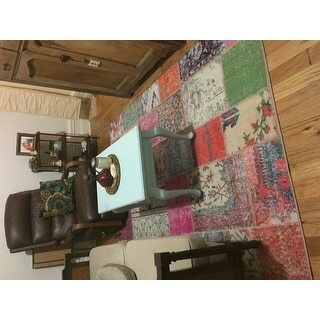 I got this rug last week to replace a smaller one that was constantly moving around. To say I love it is an understatement. The colors are amazing and it adds a great look to our log cabin. Our roomba breezes over it with no issues making it easy to keep the area clean. We have 4 dogs and they find it comfortable to rest on. Another plus to this is that it is washable. With all the activity in our household, this is a great feature. I will probably buy more rugs like this since this one is so amazing. Thanks Overstock for making it so affordable. You had the best price on it across the internet! This is the first Ruggable that I have purchased and I love it! I put it on the existing carpet in my small office and like that it lays flat. The colors are great, brightens up the whole room. Hoping to buy more of these rugs in the future! 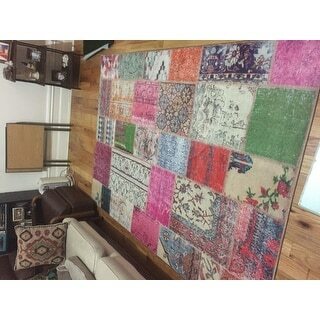 My daughter needed a rug to pull together her eclectic front room/library and this is perfect! The different colors really make the room pop. It looks terrific and is easy care with her cats. Great carpet/rug if you have pets. This goes right under my two dogs’ beds and keeps their paws quiet and off the hardwoods at night. Nice size and great that the top is machine washable. Nice pattern and design too! I wanted this soooo bad and finally got it, and it so did not disappoint. It is absolutely beautiful! You need this! Its a great concept and the rug was pretty. But I had mine in a high traffic area and the corners wouldn't lay flat and the rug kept sliding around. Cool concept being able to take it apart and wash; however, the California sun has faded it greatly and in little time. Would have been nice too to have it bigger. Looks great, feels great and not worried when dogs lay on it. Stays in place well. Highly recommend. Absolutely gorgeous colors and patterns. Can’t wait to put down once puppy is potty trained. Colors are nice and durable. I love the quality and the washablity but wasn’t in love with the color. It looked a little cheaper than I had hoped. I have other rugs from them and they look great, so this seems to just be this style that looks this way. "I'm still waiting for answer.Is this rug suitable for use on covered porch?" "Is this rug suitable for outside use on a covered porch?" "what size us this rug please? " The rug is 5' x 7'. "Is this available in other sizes?" This is the only size available. "Does this come with both parts, the top and base?" Yes, from the description I am certain it does. 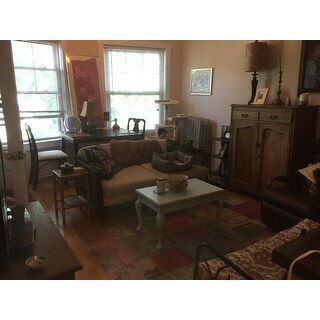 Need washable pet friendly for house with cats!! "Does this Ruggable come in a larger size?" At this time is not available in a larger size.